Submitting content to other websites and online journals is an excellent way to help you get your name, offerings and unique voice out into the wider world. Contributing content and collaborating with like-minded businesses has the potential to dramatically increase your visibility and introduce you to a new sector of your ideal demographic. When you are published on an external website, your article will have links back to your own website and social platforms. Backlinks are one of the most significant factors in Google’s ranking algorithm. Unless you are paying for Facebook or Google advertising, it can often be challenging to gain organic visits to your website. 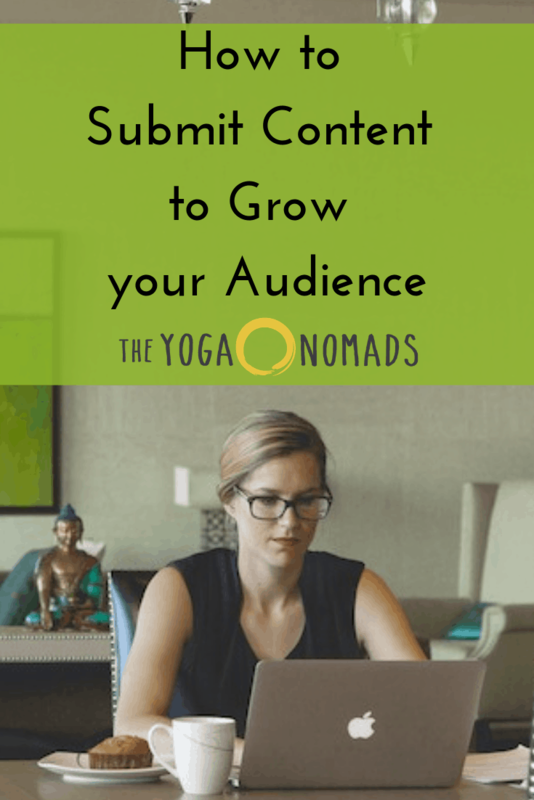 Discovering new outlets to strategically place your links is a simple yet powerful tool to increase your traffic, as well as making your name a more familiar one in the wide world of yoga! Firstly, decide what it is you want to write about. What is it that sets your business apart from others? What is your niche in the yoga world? What are you most knowledge about? What are you the most passionate about? What do you feel most confident writing about? These are all important questions to ponder. You need to consider how to select a topic that people are interested in, how to make it fresh and alluring, and how it will be appealing to the people and businesses you are pitching to. Get a list of ideas together and start to formulate some topics, but don’t start writing just yet! Before you put pen to paper, (or finger tips to keys), start to research where you want your article to get published. 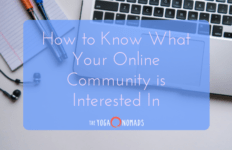 Have a good fossick around the online yoga/health/travel world and make a list of websites that you feel would be a good fit for what you have to offer, and that have a similar demographic to your ideal client. Think big, and also, think realistically- allow your list to be diverse and extensive at first. Keep in mind that different topics and styles of writing will suit different websites and platforms. Most importantly, find out if these websites do accept contributor content. Often there is a link down the bottom of the website or a clickable icon that may say ‘write for us.’ If you can’t find a contributor page, don’t be afraid to send a quick email to enquire whether a specific website does accept guest material. 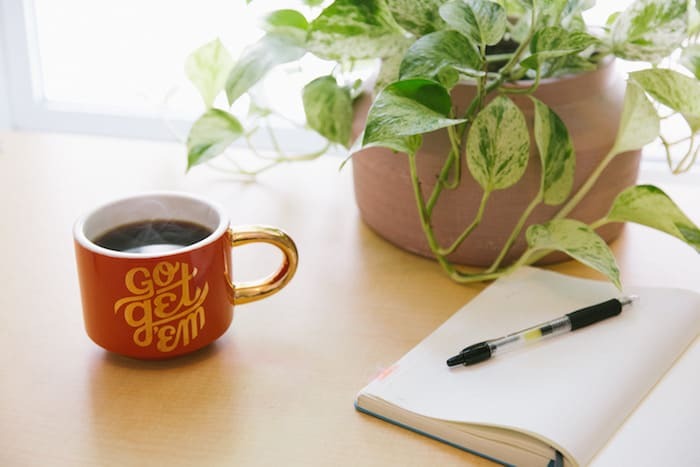 This research stage will really give you a feel for what these sites are looking for and will help you when you’re ready to write and submit. When you have your shortlist of websites that you decide are perfect for you to submit to, check their contributor guidelines. These will most often be found on each website on their contributor page. It will save you a lot of time reading through the guidelines before you sit and write! Bear in mind, each website has unique guidelines that will outline things such as word count, style, grammar, values, sources, links, images and many other things you may not yet have considered! 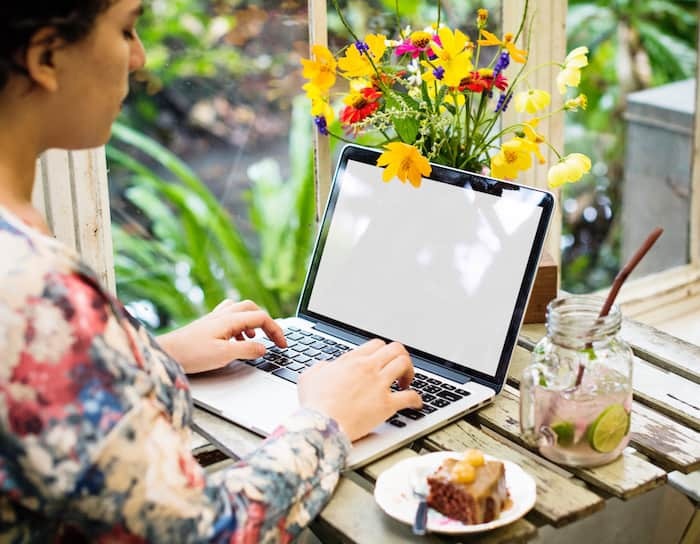 Writing your own blog allows you a great deal of freedom, whereas writing for external sources often comes with distinct and precise rules and regulations. Many websites also require the content to be unique and not published elsewhere, including your own website. The guidelines may seem extensive and elaborate at first, but just go slowly and keep them in mind as you prepare to write. See an example of guidelines here and here. You have contemplated your topics, researched your outlets, scrutinized the contributor guidelines and now have a good understanding of what is expected of you. So, it is time to write! Set your sights on one topic and one ideal website to begin with, especially if this is your first time contributing. Once you have your finished piece, go through the guidelines and make sure it ticks all the boxes- is the word count ok? Have you quadruple checked spelling and grammar? Is the title suitable? Is it formatted corrected? Have you credited external sources? Read over your piece several times to make sure it is perfect. Often, you only have the attention of the editor for several moments so it is crucial to make a good impression and not let your hard work be discarded simply because you may have overlooked something small. People do indeed judge a book by its cover, and with literally millions of new articles being published online every day, you need to make yours one that catches the eyes of your prime reader. The title should be both riveting, and also allow users to quickly identify what the article is about and why it is applicable to them. The reader also needs to know what they will gain from the article, so avoid vague or mysterious titles! For your article to have good reach, it must also have the right use of keywords and SEO header tags. Try to keep the title below 55 characters and try to use trigger keywords like how, why, or what. Address your audience directly and use an active voice so people feel as though you are speaking to them. Try researching good keywords for your title or even use a blog title generator like this one. Above all, make your title catchy and unique so it pops out. For example, instead of saying ‘The benefits of Svasana,’ try saying ‘Why you should NEVER skip Svasana!’ Play around until you find one that you think is perfect. Once you have your article complete, don’t forget to include your profile information. This will also vary between websites and publications, but generally you will need to have a short bio, a good quality image and your preferred external links that you wish to promote. Make sure your bio is a mix of informative prose and quirky ‘you-ness.’ You have a very short space to outline who you are and what you offer! Have a read of other biographies on the website to get an idea of length and style if it is not outlined specifically. When it comes to selecting your image, think carefully about how you want to portray yourself. This will depend on the publication and your bio image may change from place to place. Generally speaking, a clear, friendly portrait is a safe and professional option. The handstand shot of you in bikinis may work for some publications, but choose wisely! Last but certainly not least, select your links. Your website of course will be most important here. Some websites may also let you add one or two social platforms. Think about the platforms that are both a good representation of what you offer, as well as the platforms you currently building. Whether you include images in your submission will depend both on the topic you are writing about and the publication you are submitting to. If an image is required, it will most likely be stated in the guidelines, along with image proportions and specifications. You may be invited to send along one accompanying image to promote your article. Think carefully about the image and also its source. There are great websites now that have terrific stock images for free and these ensure you are safe to use that image without any copyright implications. Try websites such as pexels, unsplash or pixabay. For more unique images, paid stock websites also offer memberships or one off purchases. If the image is your own, make sure you ask for it to be referenced to you. If you have permission of a photographer to use one of their images, make sure it is credited to their name. Do not under any circumstances use an image when you are unsure of its source or usage rights- you may find yourself facing a large fine! 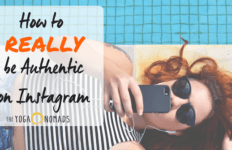 In an age of image saturation and rampant sharing, it can be easy to think that any image online is free for all, but this most certainly isn’t the case. Speaking of saturation, make sure your image is also edited and enhanced accordingly. Before you euphorically hit the send button, hold up a minute! There may also be specific instructions as to how to submit your piece. Some websites have a submission box on the contributor page which will require you to either cut and paste your work, or upload it as an attachment. Other companies will have instructions outlining what email address to send your work to, as well as the necessary subject line and what is required in the body of the email and/or attached. Read through everything carefully and follow the requirements step by step. If you can add a simple personal touch, like including the name of the person you are sending the piece to, or simply wishing them a beautiful day, do so. Do not however gush or go overboard here! The time of an editor is precious so think short, sweet and to the point. Ok, go on then, hit send! While you may be tempted to check your email notifications every three minutes, keep in mind these websites may be receiving hundreds of submissions every day. The general rule of thumb in the world of publishing is that you will hear back if the piece is accepted. If you do not hear back after a week or two, chances are this time it may not have been accepted. Having said this, there is no harm in (gently) following up. While persistence can pay off, badgering will not! One or two follow up emails would be the most you would want to ride with. If there is still radio silence, it may be time to approach another platform, or pitch a new article. Whether your piece is published or not, do not be disheartened. There are many stories of famous writers who were turned down hundreds of times before being accepted! It may take some time for you to find your niche in the wider online world. Once you get the hang of submitting material, try approaching various websites, play with different topics, get creative and put yourself out there. There is no such thing as rejection, only abundant opportunities to keep writing, sharing, researching and connecting. When the time comes and you are published, it’s time to celebrate! Share the links on all your platforms and tag the publication/website where your article can be found. Try and direct plenty of traffic there so that the page gets plenty of hits (which can increase your chances of being published again!) If the piece is shared by the website through their own channels, be sure to jump on and comment, respond to other user comments and get dialogue happening. Make sure to also check back in to see if anyone has made comments on the actual post that you can respond to. 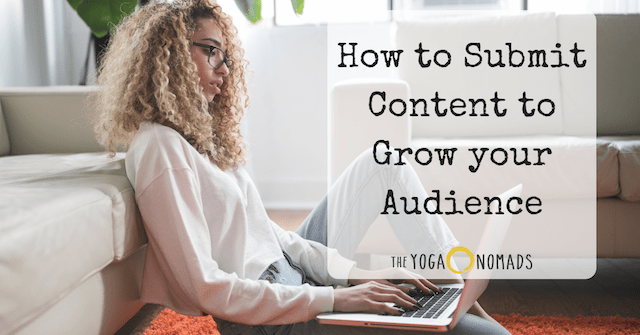 Being proactive in this crucial stage is key to growing your own following, getting people on your website, and developing a good relationship with the website that were kind enough to share your piece. Getting published by external websites not only helps to direct more people to your business, it also helps to build your credibility as a professional in your field. As you get published more and more, make sure to dedicate a space on your website that clearly states where you have been published and add your external links here. This helps your community access your articles, it helps boost your SEO and it adds a sense of professionalism to your work. Every time you get published counts; it doesn’t matter if it isn’t a hugely known international brand or publication. Sometimes the smaller, highly relevant sites produce even better results. The world of publishing can be tough to break into, so utilise your yogic wisdom- patience, dedication and persistence. Don’t be disheartened if it takes some time to be published. Some websites reply with feedback or suggestions for next time. Take all of these into consideration and use them to strengthen your proposals. Once you are published, try and build a relationship with these businesses and ask if they may be interested in an ongoing regular weekly or monthly submission. While contributor content is indeed that- content offered with no monetary exchange- it is a powerful way to build your business and increase your online community. Think of the links and shares as your exchange here. 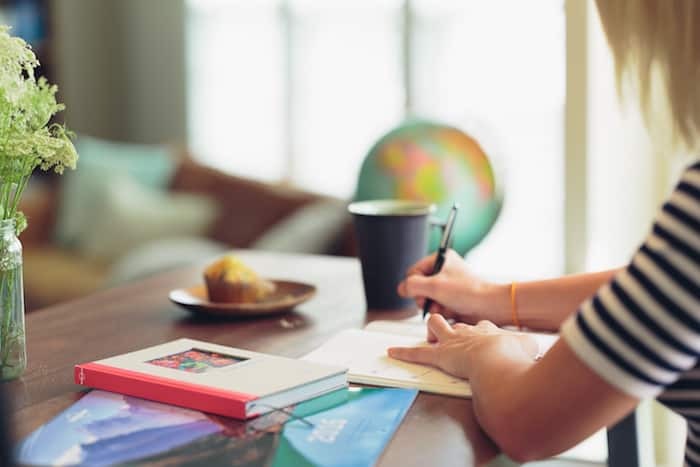 Each published piece is valuable and may indeed result in people purchasing your online offerings, coming on retreat with you, finding your online classes or signing up to your newsletters. In this light, your free content has exceptional return. 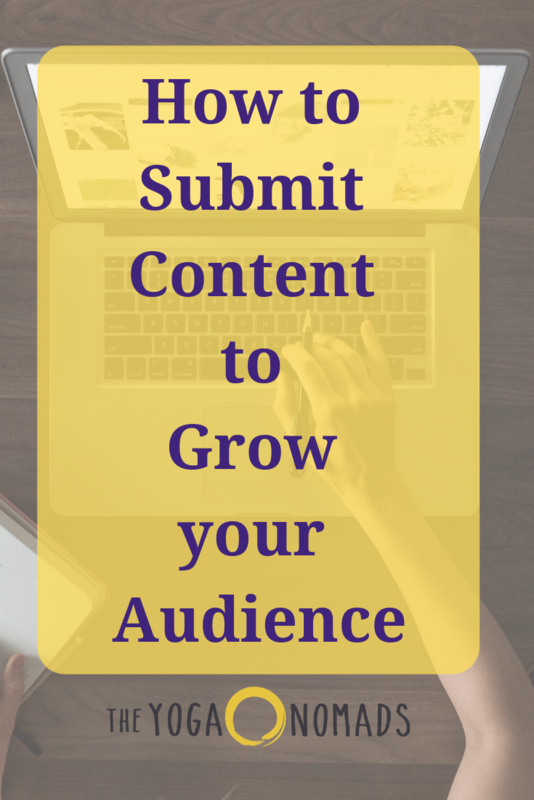 Now that you are submitting content, dont forget to keep your own website and blog updated! 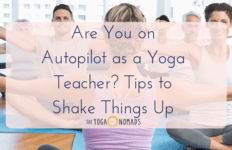 Find out why all yoga teachers need a blog here. Create a yoga website you LOVE here!